System Rescue Boot USB Stick. If you’re looking for a pre-built Windows PE, look no further and just use Gandalf’s Windows PE because it is packed with many useful programs. It has a desktop, explorer, start menu, compression tools, image viewer, hard drive tools, video player, remote access tools, and many more. Windows PE distributions are mini-Windows operating systems that one can run from a USB flash memory stick. They are extremely handy particularly when fixing a broken Windows system. I just fixed a PC suffering from a Blue Screen of death by using one. 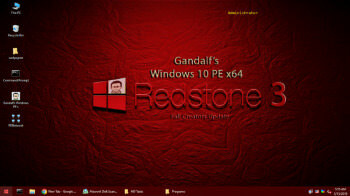 At the moment, one of the most handy Windows PE distributions is Gandalf’s Win10 PE Redstone. This “Redstone” distribution packs about 5GB of very useful programs and a fully functional super smooth version of Windows 10 into one ISO that can be installed on and booted from a USB drive. Having this available on a bootable USB stick if anything goes wrong on your windows system is SUPER handy and has saved me countless times. This tutorial will show you how to build a multi-boot USB stick that will add Gandalf’s Win10 PE distro but is also capable of adding additional operating systems on the same stick. In addition it will show you how to install Gandalf’s Win10 PE on your boot menu. So if your Windows system goes south you have a very useful toolkit available as an option on the boot screen without even needing your USB stick. Snipping Tool: Screen capture application. Wise Data Recovery: Recovery program to get back deleted photos, documents, etc. Macrium Reflect will remove the Y drive and set it as next logical drive. Just use Remount CDdrive Y found in Windows Systems folder.